To suit the Turkish government’s intolerance for gay people, the Council of Europe has changed its declaration of children’s rights to allow state discrimination that puts lives at risk. The threats the council was trying to eliminate just grew bigger. No, no, Turkey says, not gays; if you’re saying that gays are part of families with children, we have to ask you to change Europe’s version of children’s rights… Alas, that’s what happened this week. The declaration now includes the phrase: “These family forms change from one country to another.” Do they? The whole point of the declaration was to support kids whose parents might be shunned by certain countries and societies. This unnecessary protest is not only discriminatory but also exacerbates a current climate of violence against people with sexual orientations outside the mainstream. Homophobia has led to murder in a number of cases in Turkey. Last Tuesday in Istanbul someone broke into a transgender woman’s apartment, killing her by slitting her throat and stabbing her 17 times. 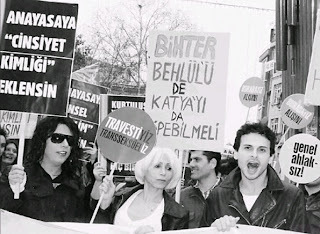 At least eight transgender people have been killed in Istanbul and Ankara since November 2008. Covering the Gay Pride Parade for the Associated Press in Jerusalem a few years ago, I watched an Ultra-Orthodox Jewish man stab a father and a young woman. The Ultra-Orthodox mayor had spoken against the “immorality” of the parade, no doubt galvanizing this man and others to attack marchers throughout the day. Turkey issued a statement this week, saying: “We do not accept gay marriages and we also do not accept the institution of homosexual family parenting.” Selma Aliye Kavaf, the minister responsible for families and women, said she informed the Council of Europe about Turkey’s “sensitivity on the different forms of families” and that they made the “necessary changes.” Was there anything necessary about this? Shame on the council. Kids can’t reject or exchange gay parents for straight ones; they only suffer when separated from them. Children in Turkey without parents can only hope that they will be taken in by loving parents, gay or straight. By law, the state can remove them from the parents or deny them inheritance. The Turkish Council of State has ruled that homosexuals should not have custody of children, but it is not a must under the law. It is precisely children in this gray area that the Council of Europe aimed to protect. Instead they have failed them. For a press statement from Lambdaistanbul (in Turkish), click here. See also Lambaistanbul's Ecem Dalga and Bora Bengisu's interview on the recent murders in Milliyet (in Turkish). See also this story from the Hurriyet Daily News on the challenges faced by LGBT women, including another interview (this one in English) with Dalga.